I use yogurt in bread quite often, but usually it's a small addition. This time, the liquid in the recipe is entirely yogurt. Then, to counteract the tartness of the yogurt, I added a generous amount of honey. The resulting bread has a dark brown crust, a soft, moist interior, and a small crumb. There's still a hint of the tartness, followed by a mild sweetness from the honey. It's not a super-sweet bread, so you could use it for just about anything, but I like think it's particularly appealing toasted, and it makes a killer peanut butter sandwich. I make my own yogurt, so that's what I used, but any commercial Greek-style plain yogurt would be fine. If you can't find Greek-style yogurt, regular yogurt would be fine, or strain out some of the whey with a fine-mesh strainer or cheesecloth. Combine the yogurt and honey in a microwave container or small pan and heat gently to warm it to room temperature and melt the honey. Stir to incorporate the honey into the yogurt. If it gets too warm, allow it to cool to room temperature. Put half of the bread flour into the bowl of your stand mixer and add the yogurt mixture and the yeast. Stir to combine. Cover the bowl with plastic wrap and set aside for 20 minutes. Add the rest of the flour and knead with the dough hook and knead until the dough is smooth and elastic. Add the salt and butter and continue kneading until it is completely incorporated. Cover the dough with plastic wrap and set aside until doubled in size, about 90 minutes. Preheat the oven to 325 degrees and sprinkle some cornmeal on a baking sheet. When the dough had doubled, remove it from the bowl and form it into your preferred shape. Place it on the baking sheet seam-side down. Cover with plastic wrap and set aside until doubled in size, about 45 minutes. Remove the plastic wrap, slash the loaf as desired, and bake at 325 degrees until the loaf is browned and the internal temperature of the loaf is about 200 degrees - about 40 minutes. Remove the loaf from the oven and let it cool completely on a rack before cutting. 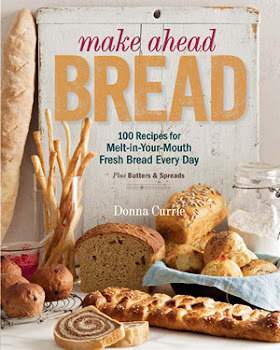 Another beautiful bread, Donna. I really love the yogurt and honey balance! Gorgeous loaf! This bread sounds really interesting...I definitely want to give it a try! I can't wait to try this! Sounds wonderful. What a beautiful crumb. Yogurt and honey make a nice balance. They're almost like opposites, which is nice since that means they attract each other. Having them in bread sounds good - the smell of fresh bread like that is quite mouth watering.